If there’s anything former Mythbusters co-host Adam Savage loves more than busting myths and walking around comic book conventions in ridiculously elaborate costumes, it’s movie props. We’ve covered his affection for that awesome gun in Blade Runner, his recreation of the Shining maze, and an enormous steampunk-y Hellboy glove. For his latest Tested video, though, Savage has decided to pay a visit to director Peter Jackson, who seems to like movie props even more than he does. Jackson’s collection is primarily based around items from movies that had a big impact on him as a kid or were somehow influential in his own filmmaking experience, and every shot from inside his huge vault features dozens of recognizable creatures, costumes, and accessories. However, rather than making a YouTube video that’s several hours long and includes every cool thing in the collection, Savage and Jackson decided to dig deep into one specific prop and try to break down why it’s so iconic. 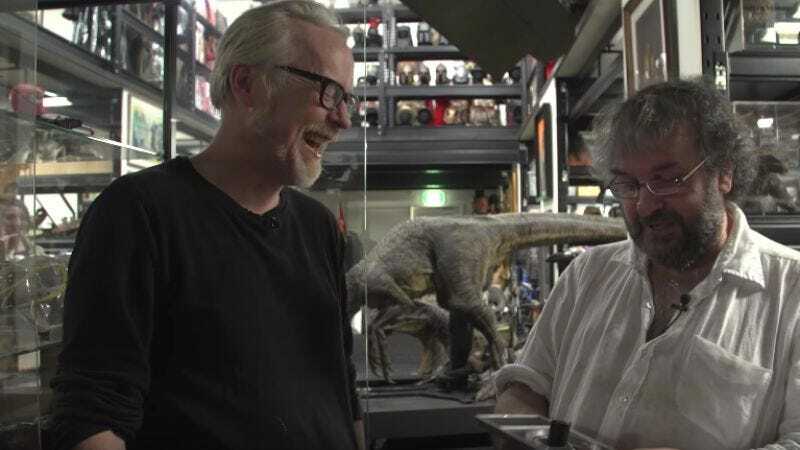 The prop they chose is one of HAL 9000’s “eyes” from 2001: A Space Odyssey, and if there was ever any doubt that Adam Savage really loves movie props, the several minutes he and Jackson spend shining a light through the thing’s lens should erase that. Really, though, would any of us behave any differently?